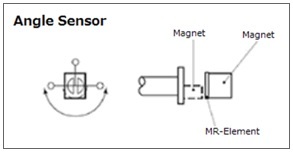 Blue Pot is the general term that Midori has used for the MR (Magneto Resistive) element contactless potentiometer. Blue Pot is identified by blue-colored name plate attached to the part. Magneto resistive element has 3 terminals. Its midpoint potential is varied by migration of the magnetic field. Voltage is supplied to each end terminals of the MR-element, then the output is created from the terminal at the middle. 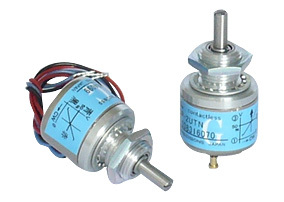 Compared to typical contact potentiometer, Blue Pot is electrically noiseless, offers high resolution, high response time, and long life. There is no electrical noise in the output regardless of the displacement velocity. Output resolution is practically infinite. 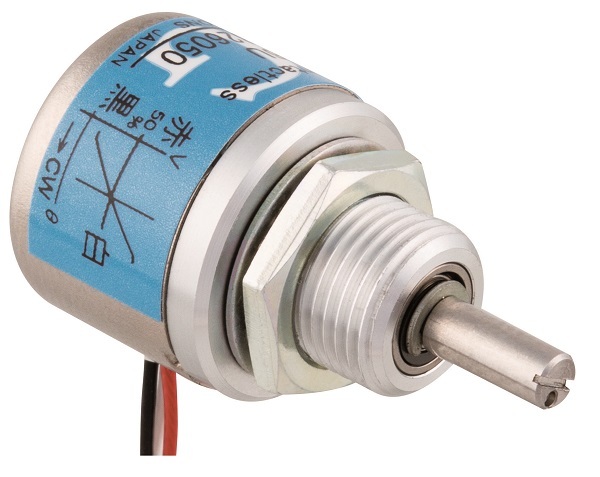 Compared to contact potentiometer such as wire wound and conductive plastic potentiometer, since there is no sliding electrical noise due to the contactless design, the output smoothness of Blue Pot is much superior to that of contact potentiometer. In theory, magneto resistive frequency-independence effect is up to 10GHz. Superior to rapid response (except built in AMP circuit type). 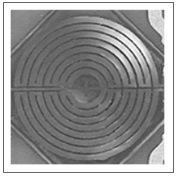 The combination of magnet and semiconductor seldomly has any needs for electromagnetic energy such as light source being needed in optical sensor (except built in AMP circuit type). There is no mechanical friction between the parts except at the shaft bearing. Blue Pot has superb long life. 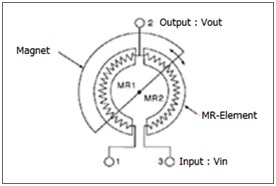 (1) Create output voltage change by planarly moving the magnet near the magneto resistive element. (2) Create output voltage change by moving the magnet resistive element near the magnet. (3) Fix the magneto resistive element and magnet close together, and move a magnetic material yoke to create output voltage change. Blue Pot uses many different converting methods. The following is a typical converting method of Blue Pot. 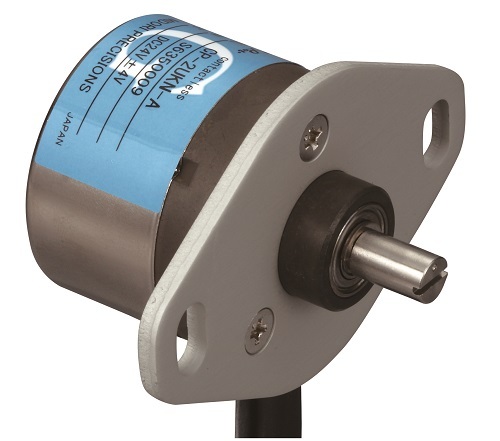 Blue Pot has superb temperature characteristics compared to contact potentiometer. Magneto resistive element for Blue Pot products has resistance temperature characteristics as shown on chart 3. Also as shown chart 4, temperature characteristics depend on the amount of density of the magnetic flux. Temperature characteristics of MR1 and MR2 at the second quadrant of magneto resistive elements are different from individuals caused by manufacturing variations. Since magneto resistive effect with temperature is not a uniform state, output voltage of Blue Pot fluctuates as shown on chart 5 with changing temperature. 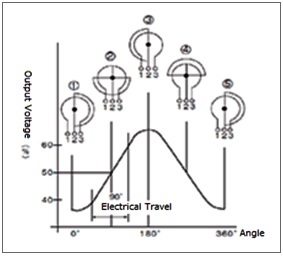 Temperature drift at middle angle position (50% output voltage position) is smaller than at other angle position. Temperature drift increases as the distance from middle angle position increases. 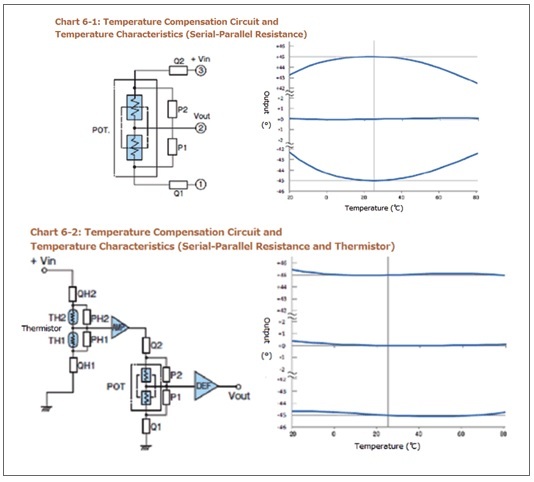 As showing chart 6-2, by also using thermistor, it is feasible to improve temperature characteristics of the whole electrical angle. • In case of selecting mounting method ‘B1’, create a shaft hole on the mounting board which diameter is larger than the pot shaft diameter. Apply voltage to terminal 1 to 3 must be lower than specified voltage. Otherwise the magneto resistive element will generate heat at the higher voltage and this will cause output deviation. 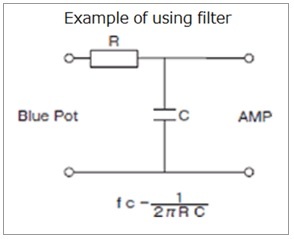 Added input impedance of AMP should be more than 500 times the impedance of Blue Pot. 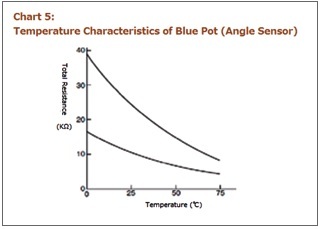 If the input impedance is lower, it will cause a decrease in temperature characteristics of Blue Pot. Reducing the distance between blue pot and AMP shall lessen the effect of exogenous noise. In case of increasing exogenous noise, connect Blue Pot and AMP by twisted pair wire or shielded wire or add low-pass filter in front of AMP.